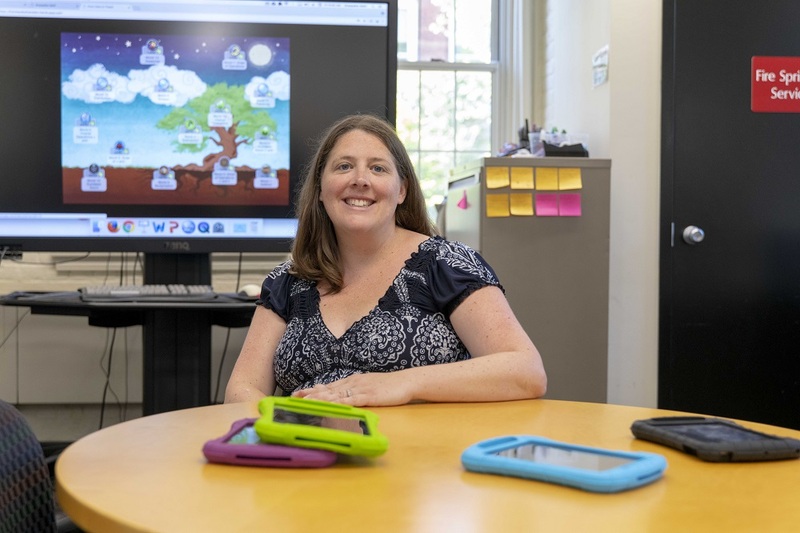 Erin Ottmar, assistant professor of psychology and learning sciences, is developing a game and an app to help students learn algebra and math problem-solving more easily, and to help teachers use tech to more effectively teach students. Erin Ottmar, an assistant professor of psychology and learning sciences at Worcester Polytechnic Institute, has received two grants totaling more than $3.4 million to develop and study new ways to help primary and secondary school students understand algebra and develop mathematical problem-solving skills, and to help teachers use technology to more effectively teach algebra and other mathematical concepts. The grants, from the U.S. Department of Education and the Small Business Innovation Research (SBIR) program, will support the development and testing of math-focused learning tools as well as research using those tools that applies theories and methods from cognitive science and education. The goal of the research is to develop a better understanding of where students most commonly struggle as they attempt to learn math, and how technology could improve learning. Algebra—the study of mathematical symbols, or notation, and equation solving—underlies most of advanced mathematics and introduces students to problem solving, logic, patterns, and deductive and inductive reasoning. Despite the importance of learning this subject, Ottmar says that many middle and high school students fail to understand basic algebraic principles, and struggle to see how those principles and problem-solving skills apply to real-world concepts. For example, Ottmar’s research cites a National Assessment of Education Progress report from 2017 in which only 34 percent of eighth graders reached proficient or advanced levels in math; among low-income students, only 18 percent reached proficiency, and 45 percent were below the basic level. Additionally, in 2008 the National Math Advisory Panel reported that algebra was an area of special concern for student learning. In her research, Ottmar focuses on developing a deeper understanding of how to assess the level of a student’s understanding of mathematical concepts, as well as the strategies and approaches that students use to tackle math problems. This work has led her to believe that the most effective learners use a variety of tools, including movement and gestures, to visualize and identify mathematical patterns. The study of movement in learning is called embodied cognition, and Ottmar and colleagues at Indiana University have combined theories from that field with elements of game development to develop learning tools that introduce movement into mathematics learning. With a three-year, $3.3 million award from the U.S. Department of Education, Ottmar will examine the efficacy of one of those tools, “From Here to There!” This game-based learning intervention, played on a tablet computer, lets students explore patterns and properties of arithmetic and symbolic algebra through discovery-based puzzles. The game, co-developed by Ottmar, uses perceptual learning (which involves sensory interaction with the environment), embodied cognition, and game design elements to address factors that hamper students’ understanding of basic algebraic concepts and real-world applications of math. In the game, students can physically drag, drop, cancel, and split numbers, terms, and pieces of an equation in real time in order to transform the expression into equivalent states—basic skills needed to solve algebraic equations. Ottmar is working with a team that includes researchers from WPI, Indiana University, University of Maine, and Westat, a Maryland-based corporation that provides expertise in statistical survey research, custom research, and program evaluation studies across a range of subject areas. Over the course of a year, the researchers will test how a group of low-performing students use “From Here to There!” and compare its effectiveness to two other learning programs: Dragon Box, an algebra-learning game, and ASSISTments, an online learning platform also developed at WPI. The results will be compared to those of a control group who will not use these interventions. Ottmar hopes to gain a better sense of how well “From Here To There!” engages students and improves their achievement and growth in math. She also hopes the research will create a better understanding of how perceptual learning, attention, and gesture-based computer interfaces influence math reasoning in a classroom setting, and to ultimately make these interfaces as natural and intuitive as possible. The eight-month, $199,681 award Ottmar received from The Small Business Innovation Research (SBIR) program will support the development of another technology tool known as Graspable Math. The application helps students become fluent and flexible users of algebra and provides teachers with formative assessments about students’ performances. The final product will consist of three parts: an app that gives students instant feedback as they work on algebra activities and creates assessments for teachers; a library of algebra activities, organized by standards, topics, and grades for teachers to assign to students; and a professional development plan for training teachers to integrate the app into their classroom practices. SBIR grants encourages domestic small businesses to engage in federal research/research and development that has the potential for commercialization. In addition to providing students and teachers assistance, the research team—led by principal investigator Erik Weitnauer, with colleagues at Indiana University and WPI—plans to license the app directly to schools and tutoring centers. Ottmar and her colleagues also hope to license the Graspable Math software to publishing companies for integrating these tasks into their own digital instruction and assessment materials. How did Erin come up with the ideas for "From Here to There!" and Graspable Math? It took a little bit of travelling the world and falling in love with the way students learn. Read more about it in The Daily Herd.